Hiya friends! I know it's Tuesday and not Monday when I usually post my pocket scrapbook pages. Yesterday's Sweet Stamp New Releases fell on a Monday and so I switch the days around a bit. It's finally summer break for us and the kiddos are sick, of course! So, that means the rest of this month is going to have a few days where I mix things up from my regular schedule. I'm not normally a scheduler anyways, LOL! 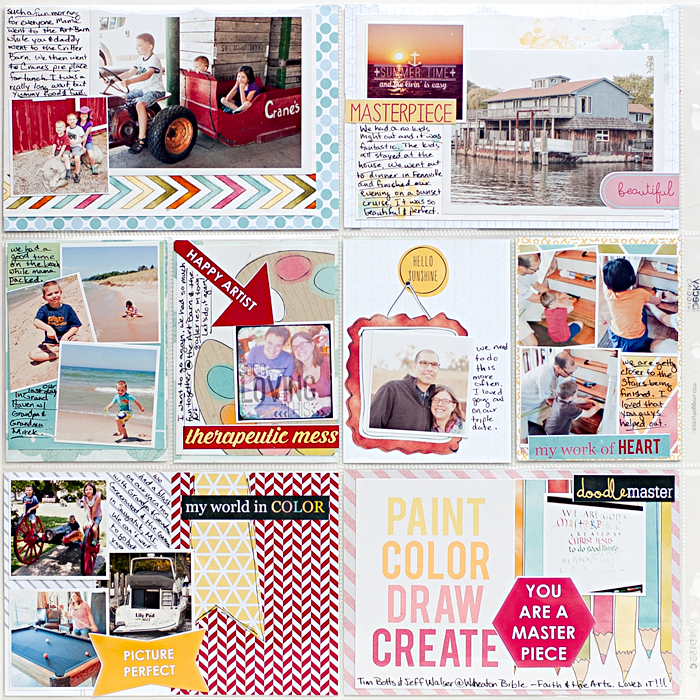 Today I'm sharing with you my page for Week 28 of our weekly pocket scrapbooking album. It's pretty simple and I'm totally ok with that. I'm a few weeks "behind", so I'm just trying to get them recorded as quickly as possible and not worry so much about adding all the mixed media touches. This kit was just too perfect for our vacation in Saugatuck, MI. It also fit perfectly with our church's message from their special summer series. It was about Faith and the Arts. I really enjoyed what Jeff Walser and Tim Botts had to say. It also gave hubby a glimpse into how my brain works. Have I told you that we're complete opposites? It can be a challenge at times, but we totally complete each other. I know it's cheesy, but it's true. He's help me with my compulsiveness, and I've helped him to loosen up a little. So, I'm going to continue to mix things up on the blog again this week and I'll be back on Friday with Week 29, and a little bit about digital mixed media for our mixed media tutorial. See you then!